One solution to homelessness just got a lot easier to see. 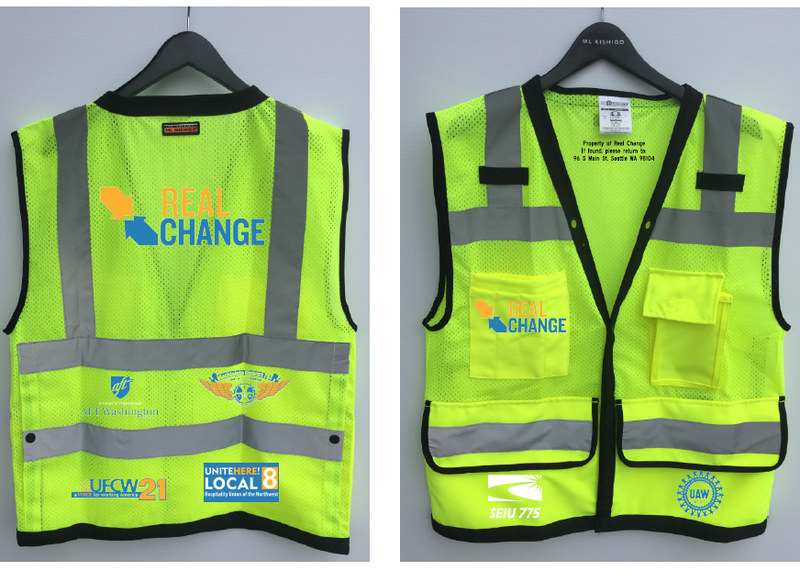 On December 6, vendors of Seattle's Real Change newspaper will don bright vests provided by Granite Construction, United Food and Commercial Workers Local 21, the American Federation of Teachers (AFT), IAM District 751, SEIU 775, UAW 4121, and Unite-HERE Local 8. "Street papers around the world have found that bright vests make their vendors easier to see and approach, and that means increased vendor success," said Real Change founding director Timothy Harris, "We are very grateful to Granite Construction and our allies in the labor community for making this initiative possible." UFCW 21 is joined as lead sponsor, with additional support from the American Federation of Teachers (AFT), IAM District 751, SEIU 775, UAW 4121, and Unite-HERE Local 8. Sponsor logos will appear on the vendor vests along with the Real Change insignia. "Real Change vendors have stood with our members in the fight for fair contracts, and we are delighted to stand with the workers of Real Change,' said Todd Crosby, President UFCW 21. 'The vendor vests are a way for labor to show that we're all working together for change." Granite Construction is a national heavy civil construction company with regional Pacific Northwest operations and a construction supply shop in Everett, WA. Granite Construction is providing the first 200 high quality vests for free and is supplying the remaining 500 vests at cost. Granite Construction and Real Change will come together on Dec. 6 at their new issue truck unload and host a release party to distribute the vests. Sponsors will be available for interviews at 8:30 a.m. and media friendly vendors will be available on location in downtown Seattle throughout the morning.